An artist's conception of what an Obama clone would look like. 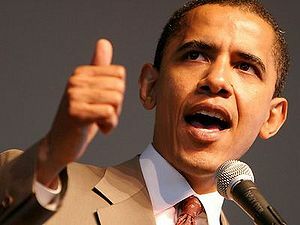 WASHINGTON DC --- President Barack Obama today reversed former President Bush's ban on creating new stem cell lines. In the same memorandum, the Commander In Chief indicated he plans on giving stem cells from his own body to scientists in order to "produce a clone of myself." Obama compared this goal to the space race during the 1960s, and rallied supporters to "create a duplicate of my perfectly sculpted body and brilliant mind by the year 2019." The former administration had banned federal funding for any stem cell lines created after August 9th, 2001, the day George W. Bush issued his decision on the issue. Ironically, Obama praised Bush for his decision at the time, explaining that "the ban ensures that we will never have a clone of the incompetent Bush, thank God." However, now that Bush is no longer in power, Obama claims he no longer fears a Bush clone will be possible. In fact, fine print in his executive statement dictates that "all human cloning is forbidden, except for the cloning of Barack Hussein Obama." Joking with reporters, the President added that even that exception to the rule is just a formality because "really, I don't even qualify as human. I am superhuman." Much of the recent federal stimulus package will be devoted to the cloning program. "We need every available scientist working on this," asserted the President, "forget AIDS or cancer research - if you create enough clones of me, the clones will solve all those problems at a later date." If the initial clone proves to be viable, Obama envisions creating a whole army of them to fill every government post. Using FDR's "court packing" as a model, the President explained, "All of America's problems will be instantly solved if I become the Governor of every state," adding that he is confident that within 50 years the Supreme Court will consist entirely of him. Confronted by critics who pointed out that the clones will be at most 7 years old by the time Obama leaves office, the President answered that "scientists are already working on clone incubators that will speed the growth process exponentially. We will be able to grow 35 year-old Obamas in a matter of days." Religious opponents who view the idea as an abomination of God were scoffed at by the President, who declared "I am God." Obama plans a televised speech to the nation on Monday night to reveal more details about his cloning plan. Copies of the speech leaked to the press indicate that the President will justify his actions by asserting that his election marked a "new era of procreation for the world," and that the people's trust in him must last "in perpetuity." One line reads "we must ensure that I will be President till the end of time. Do you really want to take the chance of electing someone who will end up being a tyrannical ruler like George Bush?" Even advocates of scientific research are a bit skeptical of the cloning plan. "What if this technology falls into Republican hands," one asks, "what if they make a clone of Rush Limbaugh?" Obama assures them, however, that by the time the technology is fully developed Rush will be long dead from a heart attack or Oxycotin overdose. This page was last edited on 5 June 2012, at 04:16.